What are the advantages and disadvantages of incorporating technology into the classroom – with a specific focus on non-ICT lessons? The use of Information Communication Technology (ICT) in education has been described as engaging, enabling and transformative (Clark et al. 2009; Prensky, 2010). ICT can improve both personalisation and collaboration, providing tools and experiences that can aid social and independent learning (O’Hara, 2008; Selwyn et al. 2010). Throughout non-ICT subjects, technology can help to create an ‘enabling environment’, founded on communication and interaction (O’Hara, 2008, p.29). ICT can also structure children’s understanding of curriculum content in non-ICT lessons, while helping them to develop knowledge of processes that will be of significant use in their future lives (DfES, 2006). However, only one in four schools are succeeding in employing ICT to enhance learning across the curriculum, which suggests that there are barriers to the effective use of ICT in non-ICT lessons (BECTA, 2009). While developing practical skills with technology is essential, children will also need to cultivate a reflective, ‘metacognitive awareness’ (Flavell, 1979, p.908) of their own creative and safe engagement with ICT in order to use it effectively in non-ICT lessons (Sharples et al. 2009). This concept has been defined as ‘e-confidence’ and is a key concern for teachers when planning learning experiences involving ICT (QCA/NAACE, 2007). By referencing this matrix against other educational theories, it will be argued that embedding technology into non-ICT has the potential to extend and empower learners (Blows, 2009). 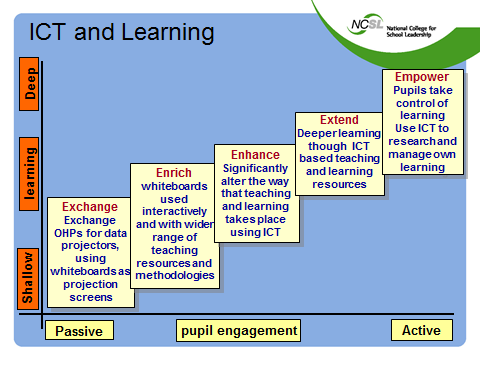 However, the key point is that ICT needs to be used to support, challenge and ’empower’ learners, rather than simply being ‘exchanged’ for traditional teaching methods in order to meet national agendas (Blows, 2009). Blows (2009, no page numbers) emphasises the importance of using ICT to ‘enhance’ learning, rather than simply ‘exchange’ it with traditional resources. Furthermore, Prensky (2010) recognises the limitations of using technology just for the sake of it. For example, using an iPAD or SMARTboard as a dynamic, problem-solving device for group work in mathematics or geography would be beneficial to supporting cognitive development (Adey, 1992). However using these technologies as basic presentation tools, or only to display multimedia content would be a less effective use of the resources. Tondeur et al. (2006, p.963) assert that schools concentrate too much on teaching the practical use of ICT programs, rather than using technology to improve learning, collaboration and cognition. ICT is still seen as separate from other subjects and needs to be embedded into non-ICT subjects more organically (Tondeur et al., 2006). However, this should not be at the detriment of traditional skills, for example map reading and measuring in geography. ‘from a focus on information to communication, […] from a passive to more interactive engagement, and [….] from a focus on individual learners to more socially situative learning’. The implication is that technology must be harnessed to ‘extend’ learners, rather than ‘passively’ replacing previous resources (Blows, 2009). By successfully integrating technology into non-ICT subjects, ICT can create collaborative experiences that are both engaging and more effective than was previously possible (O’Hara, 2008). For example, students can use the internet to research and share knowledge, and use creative computer programs in collaboration with other social groups. However, a disadvantage of using ICT is that it can hinder student’s cognitive and problem-solving by providing too much support (O’Hara, 2008). An interactive database in science is beneficial to learning, but should not over-simplify learning as this would be to the detriment of student progression and understanding. In contrast, the new ‘Computing Programmes of Study’ (DfE, 2013) suggest that students need practical skills in computing before ICT can be used to enhance non-ICT subjects. ICT can be advantageous in non-ICT subjects as long as it balances practical application with collaborative and creative learning. Technology can be employed in non-ICT lessons to support children in creating material for specific purposes and audiences, using various modes of communication (Bearne, 2003). An example of this could be setting up a class blog in Literacy or Art lessons with which pupils could display and discuss their work and learning, using photos and sound files to create their own multimodal blog-site. Richardson (2009, p.27) argues that ‘blogs are a truly constructivist tool for learning’ and can therefore be employed by teachers to engage and structure learning. It has been suggested that while formal writing can be described as independent ‘monologue’, blogging should be regarded as a ‘conversation’ (Selwyn et al. 2010, p.30). ICT allows children’s work to be dynamically shared with parents and family on a regular basis, resulting in the continuation of learning outside of school and improved links to the community. However, while ICT can provide a supportive learning framework or resource, this relies on the teacher to guide children through progressive stages of learning (Wood et al. 1976). The use of ICT in non-ICT lessons relies on the presence and planning of a skilled teacher who recognises how to harness technology to improve learning, rather than just replace, for example, existing literacy practices. When embedding ICT into non-ICT lessons, the teacher should act as a facilitator and enabler, using technology as a tool to increase learning possibilities for a group of children working at different attainment levels (Prensky, 2010). Technology can enhance learning by connecting the elements of exploration, contribution and completion (Richardson, 2009). An example is the proposal that video games can engage reluctant learners (DfES, 2005). Young pupils may have become disengaged by a ‘digital divide’ between their home use of ICT, and the ICT that they have access to in school. Therefore, using games as a learning resource in Mathematics or Geography could create links between home interests and school classroom cultures (Sutherland-Smith et al. 2003, p.31). Using ICT to connect curriculum areas has the potential to increase social participation in schools and reengage disenfranchised learners (Clark et al. 2009). An example of this concept is the video game Wild Earth: African Safari on Nintendo Wii; in which the player is a photojournalist touring the Serengeti National Park, taking photos of indigenous animals. This game could be used to actively demonstrate a different part of the world to young learners, which would be impossible without ICT. Children could subsequently create paintings, drama or simply discuss what they have seen to improve collaboration and cognition (Hong et al. 2009). ICT can therefore enhance cultural understanding and critical thinking in non-ICT subjects (Hague and Payton, 2010). However, the teacher’s selection of game, or other ICT resource, must be relevant to the learning experience and support the achievement of learning objectives, so that technology is not simply replacing traditional resources (Learning and Teaching Scotland, 2010). Structured by their interactions with ICT, children can develop communication skills that will prepare them for the future. However, it could be argued that ICT is never a substitute for real experiences. It should instead be viewed as a tool for improving non ICT-lessons. This example demonstrates that ICT offers teachers a set of ‘virtual tools’ that can enhance learning in non-ICT lessons (Simpson and Toyn, 2012, p.1). However, students will need to be taught how to use these tools effectively so that they can employ them in non-ICT subjects. ICT in other subjects requires additional training and instruction, which may detract from general teaching and learning time (Simpson and Toyn, 2012). Using technology in non-ICT lessons is all about balance, with the teacher needing to balance ICT with traditional and transitional learning skills in order to support progression. ICT can enhance (Blows, 2009) learning experiences in non-ICT lessons by structuring the development of skills and understanding. However, Prensky (2010, p.72) proposes that there is a difference between a learning experience being relevant to children and being ‘real’. Rather than providing passing allusions to children’s interests, teachers must use ICT to find ways to help children connect with ‘real’ issues. ICT must be employed in ‘authentic and purposeful contexts’ (Loveless, 2003, p.102) to empower learners (Blows, 2009) so that they can achieve a greater understanding of a topic in non-ICT lessons. An example is using video-conferencing technology to create links between the classroom and other areas, and broaden the landscape for learning. A teacher could set up a conversation with a school in a different location, with a contrasting community but similar issues. Classes could ask each other questions and describe their school and community environments. This would support the development of speaking and listening skills, alongside ‘personal [and] social development’ (DfCSF, 2008, p.13). By linking learning to other places and communities, ICT can create a wider ‘community of practice’ in non-ICT lessons, where young children recognise that education and learning are not isolated to their school location (Wenger, 1999, p.4). Technology can therefore have a positive and transformative effect (Wheeler and Winter, 2005) by allowing children to develop personal reflection during purposeful social participation (Richardson, 2009). However, young people need to recognise how to utilise technology to support their ongoing learning. Hague and Payton (2010, p.8) argue that ‘education systems need to help young people to understand and benefit from their engagement with digital technology and digital cultures’. ICT supports and extends (Blows, 2009) both independent and social progression, but young people need to recognise how to use technology as a tool to expand their learning in non-ICT lessons. An appraisal of advantages and disadvantages of using ICT in non-ICT lessons needs to investigate potential problems and highlight areas of concern. Critics argue that early computer use can affect young children’s vision and physical development, leading to a possible deficit in the advancement of their motor skills (AfC, 2000). Furthermore, technology can often fail to work, which could disrupt lessons and demotivate learners in non-ICT lessons (O’Hara, 2008). Practitioners also need to be knowledgeable enough to successfully integrate ICTs into teaching and learning, and this is reliant on available budgets for high quality training (O’Hara, 2008). A lack of expertise can be a ‘limiting factor’ that can negate the potential of ICT to improve learning across the curriculum (Beetham, 2007, p.32). Similarly, students may have different skill-levels with ICT, so the teacher needs to incorporate this into lesson planning in the same way that they would differentiate by ability in core subjects (Hague and Payton, 2010). Perhaps the most debated area of concern of using ICT across the curriculum is that of ‘e-safety’ (Sharples et al. 2009). The integration of ICT into non-ICT lessons must be supported by a comprehensive school e-safety policy (Byron, 2008). The supposed ‘moral panic’ (Bennett et al. 2008, p.775) associated with children’s use of ICT, particularly the internet, can create pedagogical difficulties for teachers. A balance must be achieved between encouraging pupils to participate in creative, collaborative activities in non-ICT subjects, while also protecting them from risk (Sharples et al. 2009). Prensky (2009) asserts that adults should not simply instruct young learners about the risks associated with using ICT. Children must also develop ‘digital wisdom’ in order to understand safe practice and an awareness of their identity as users of technology (Prensky, 2009, p.11). The topic of e-safety shows that incorporating technology into non-ICT lessons has simultaneous advantages and disadvantages that need to be diligently managed by the school, the teachers, and by the students themselves. The use of technology in non-ICT lessons can engage learners and enhance learning experiences (Wheeler and Winter, 2005). However, the integration of ICT into classroom practice requires balance so that it does not detract from physical and social development (AfC, 2000). ICT can be embedded into learning activities to improve collaborative learning (DfES, 2006), yet it also supports the personalisation of activity and assessment. Activities involving ICT should negotiate a balance between creativity and safety, in order to adhere to the school’s e-safety policy (Sharples et al. 2009). Children need to develop practical skills in ICT, alongside a social and cognitive awareness that will help them to succeed in a technology-driven society. An essential part of using ICT in non-ICT lessons is that young children are gradually encouraged to recognise the difference between information and knowledge (Nutt, 2010). ICT provides new means to investigate and retrieve information (BECTA, 2009) and empowers learners (Blows, 2009) with new modes of communication (Bearne, 2003). However, these benefits would prove irrelevant without the transformation of information and digital discourse into knowledge and understanding. Technology can have huge advantages for learning in non-ICT lessons, while the disadvantages and barriers can be managed by educators. However, ultimately, it is not what ICTs children are using across the curriculum, but what they are using them for that really matters for the future. Adey, P. (1992) ‘The CASE results: implications for science teaching’. International Journal of Science Education. 14 (2) pp.137-146. AfC (2000) ‘Fool’s Gold: a critical look at computers in childhood’. [Online]. Available at: http://www.allianceforchildhood.org/fools_gold (Accessed: 6th Oct 2015). Bearne, E. (2003) ‘Rethinking literacy: communication, representation and text’. Reading, Literacy and Language. 37 (3) pp.98-103. BECTA (2009) ‘Becta’s Contribution to the Rose Review’. [Online]. Available at: https://clc2.uniservity.com/GroupDownloadFile.asp?GroupId=20115174&ResourceId=2892751 (Accessed: 7th Oct 2015). Beetham, H. (2007) ‘An Approach to Learning Activity Design’, in Beetham, H. and Sharpe, R. (eds.) Rethinking Pedagogy for a Digital Age. Abingdon: Routledge, pp.26-40. Bennett, S., Maton, K. and Kervin, L. (2008) ‘The ‘digital natives’ debate: A critical review of the evidence’. British Journal of Educational Technology. 39 (5) pp.775-786. Bloom, B.S. (1956) ‘Taxonomy of Educational Objectives: The Classification of Educational Goals’, in Bloom, B.S. (ed.) Taxonomy of Education Objectives, Handbook 1: Cognitive Domain. New York: McKay, pp.201-207. Blows, M. (2009) ‘E-words for ICT and classroom creativity’. National College of School Leadership. [Online]. Available at: http://future.ncsl.org.uk/ShowResource.aspx?ID=812 (Accessed: 7th Oct 2015). Byron, T. (2008) Safer Children in a Digital World: the Report of the Byron Review. Nottingham: DCSF Publications. Clark, W., Logan, K., Luckin, R., Mee, A. and Oliver, M. (2009) ‘Beyond Web 2.0: mapping the technology landscapes of young learners’. Journal of Computer Assisted Learning. 25 (1) pp.56-69. Conole, G. (2007) ‘Describing learning activities – tools and resources to guide practice, in Beetham, H. and Sharpe, R. (eds.) Rethinking Pedagogy for a Digital Age. Abingdon: Routledge, pp.81-91. DfCSF (2008) Statutory Framework for the Early Years Foundation Stage. Nottingham: DfCSF Publications. DfE (2013) ‘Computing programmes of study: key stages 1 and 2’. DfE. [Online]. Available at: https://www.gov.uk/government/uploads/system/uploads/attachment_data/file/239033/PRIMARY_national_curriculum_-_Computing.pdf (Accessed: 6th Oct 2015). DfES (2005) Harnessing Technology: Transforming Learning and Children’s Services. Nottingham: DfES Publications. DfES (2006) 2020 Vision: Report of the Teaching and Learning in 2020 Review Group. Nottingham: DfES Publications. Flavell, J. (1979) ‘Metacognition and cognitive monitoring: A new area of cognitive-developmental inquiry’. American Psychologist. 34 (10) pp.906-911. Hague, C. and Payton, S. (2010) Digital Literacy Across the Curriculum. Bristol: Futurelab. Hong, J-C., Cheng, C-L., Hwang, M-Y., Lee, C-K. and Chang, H-Y. (2009) ‘Assessing the educational values of digital games’. Journal of Computer Assisted Learning. 25 (5) pp.423-437. Learning and Teaching Scotland (2010) ‘About Game Based Learning: what children learn’. [Online]. Available at: http://www.ltscotland.org.uk/usingglowandict/gamesbasedlearning/about/understanding.asp (Accessed: 6th Oct 2015). Loveless, A. (2003) Role of ICT. 2nd edn. London: Continuum. Nutt, J. (2010) ‘Professional Educators and the evolving role of ICT in schools: Perspective Report’. [Online]. Available at: http://www.cfbt.com/evidenceforeducation/our_research/evidence_for_schools/school_improvement/the_role_of_ict_in_schools.aspx (Accessed: 7th Oct 2015). O’Hara, M. (2008) ‘Young children, learning and ICT: a case study in the UK maintained sector’. Technology, Pedagogy and Education. 17 (1) pp.29-40. Prensky, M. (2009). ‘H. sapiens digital: From digital immigrants and digital natives to digital wisdom’. Innovate 5 (3) pp.1-9. [Online]. Available at: http://www.innovateonline.info/index.php?view=article&id=705 (Accessed: 6 Oct 2015). Prensky, M. (2010) Teaching Digital Natives: Partnering for Real Learning. London: SAGE. QCA/NAACE (2007) ‘E-Learning: What is it, why it is important and how it will develop?’ [Online]. Available at: http://www.shambles.net/elearning/publications/elearning_naace_aug07.pdf (Accessed: 6th Oct 2015). Richardson, W. (2009) Blogs, Wikis, Podcasts and other Powerful Web Tools for Classrooms. 2nd edn. London: SAGE. Selwyn, N., Potter, J. and Cranmer, S. (2010) Primary Schools and ICT: Learning from Pupil Perspectives. London: Continuum. Sharples, M., Graber, R., Harrison, C. and Logan, K. (2009) ‘E-Safety and Web 2.0 for children aged 11-16’. Journal of Computer-Assisted Learning. 25 (1) pp.70-84. Simpson, D. and Toyn, M. (2012) Primary ICT Across the Curriculum. 2nd edn. London: SAGE. Sutherland-Smith, W., Snyder, I., and Angus, L. (2003) ‘The Digital Divide: differences in computer use between home and school in low socio-economic households’. Educational Studies in Language and Literature. 3 (1-2) pp.5-19. Tondeur, J., Van Braak, J. and Valcke, M. (2006) ‘Curricula and the use of ICT in Education: Two Worlds Apart?’ British Journal of Educational Technology. 38 (6) pp.962-976. Wenger, E. (1999) Communities of Practice – Learning, Meaning and Identity. Cambridge: Cambridge University Press. Wheeler, S. and Winter, A. (2005) ‘ICT – Winning Hearts and Minds’, in Wheeler, S. (ed.) Transforming Primary ICT. Exeter: Learning Matters, pp.7-25. Wood, D., Bruner, J. and Ross, G. (1976) ‘The role of tutoring in problem solving’. Journal of Child Psychology and Psychiatry. 17 (2) pp.89-100.